You guys have something to say about it? Something to change, to improve, any tips? My only comment would be that the water seems a bit too blue for such a grey sky. and the snow is a touch featureless. Also if it's a game a scrolling cloud line would look amazing, but i'm just saying that because I want to see more of your skies tbh. The thermometer needs gem-like highlights, both in and out of the glass, like the gems in this piece. Also I'm afraid it's not very readable when covered in frost. The colors of the gif and png mockups appear quite different on my monitor. Is this how you made them, or just another instance of the png color curse? I'd change the water colours due the grey sky, but I want to let some cartoonish atmosphere too. The sky will move, yeah. Oh, I think I didn't pay much attention when I saved the png and the gif images, so one must have been uploaded with less colours. But it's alright. I started working on the character animations, too. 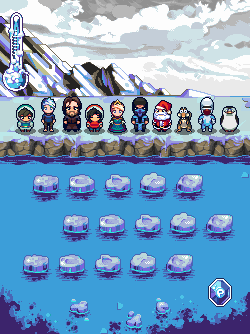 I suppose that the floor that the characters are on the third image, is ice...Is it? If it is, I think reflecting both the mountains back there and the characters it will be nice. The sky could be more blue-ish, is kinda gray... The characters are awesome , really. 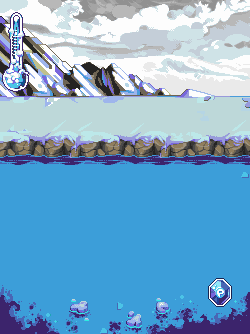 Consider improving water animation, maybe putting more frames to smooth.Hope some of these gifs can help you. The water is very dark too. Too much purple i think. About thermometer, it is incredible! Leave it intact, is actually very good. Thermometers usually go the otherway, with the red bit going down from the top. Looks great otherwise, and I did like the frost you did on the previous thermometer. Thermometers usually go the otherway, with the red bit going down from the top. Hmm, I have never seen a thermometer going down from up. 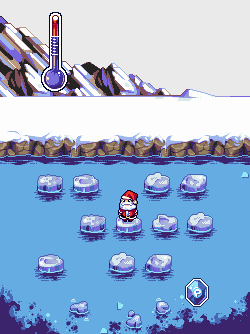 I think the thermometer looks great with all those freezing effects and stuff. I love the chars and the colors. The char third from the right looks really funny and cute. I also love what you did with sub-zero. Is this for an Android game? Great stuff! Cream, it was supposed to be snow, haha. I missed that. But I made ​​some color adjustments and I think now it looks like it. I 'll try to Improve the water movement later, thanks for the references. (I removed the skies for a while , I want to make a parallax movement and that one was not made ​​for this at the beginning. Maybe I'll try to add some frost into the new thermometer, too. Is this for an Android game ? Great stuff ! Yes! Android, iOS and Windows Phone (plus tablets).